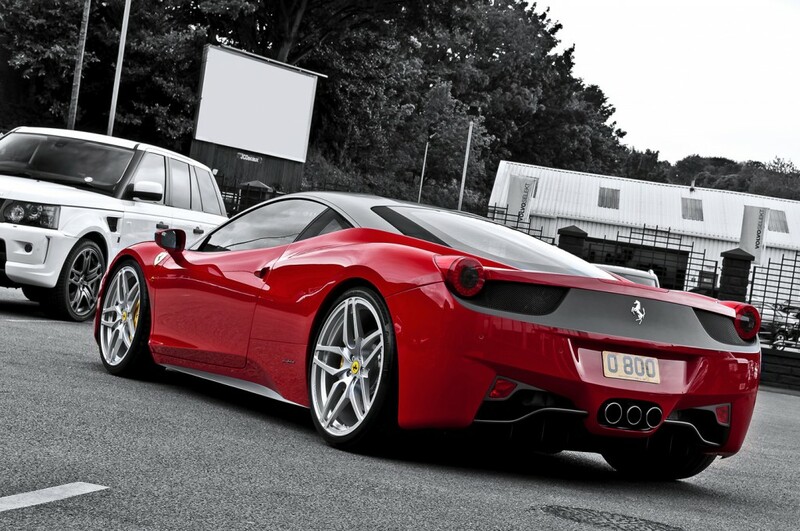 Ferrari 458 went to a serial manufacture in 2009 year, and already till 2010 has sold 1 200 cars. To measures the popularity this is an outstanding indicator of sales. So Spyker Aileron is the direct competitor of 458th it is rare when finds more 20-ati buyers for one year. But Ferrari 458 it is necessary to struggle for the buyer not only with Spyker the potential client can choose Lamborghini Gallardo, or McLaren MP4 why Ferrari is on sale so better the competitors? So force of a brand is great, work of dealers is so magnificent, or there is that that still? Ferrari way is not covered by petals of the roses, one of acknowledgement of it are served by incident of 2010 year when the reputation of Ferrari has been a little damped because of cases of self-ignition of model 458. It was found out that glue on which sound-proof panels of a motor compartment fasten, under the influence of high temperatures is diluted and lights up. As soon as the self-ignition reason has been revealed, all 458-s’ have been withdrawn for elimination of dangerous defect. What capacity of your car? On the majority of modern cars engines in volume 1.2 – 1.6 l are established, and is rare when liter capacity of these motors exceeds 75 HP what to tell if the engine VAZ 21093 at volume in 1.5л develops 75 horsies, and on Ferrari 458 Italia from each liter of volume 126 horsepower’s act in film! And after all at this Italian car engine volume far not 1.6л). From the very beginning of works Michael Schumacher took part in working out, he helped to create as much as possible effective car which can brag not only storm dispersal, but also exact roadability that it is possible to combine far not on each super-coupe. Prefix Italia says that in Ferrari considered the given car worthy to bear a name of the native land of the legendary company. Ferrari 458 body is made of aluminum, in power structure of this “stallion” you do not meet carbon, but in places of fastening of a suspender the design is strengthened cast, instead of the pressed details that raises strength and reliability of power structure of a body. In comparison with the previous model – F430 body stiffness on torsion, at new Ferrari on 20 % above. The equipped weight in 1380 kg is a bit less, than at Spyker Aileron. At movement on the maximum speed, on model 458 body press 300 kg clamping force, certainly it not 2 tons pressing Sallen S7, but these are absolutely different cars. At length of a body in 4 527 mm, a wheelbase of the Italian coupe – 2 650 mm, width of a body – 1 937 mm, and height – 1 213 mm. The road gleam (ground clearance) in 113 mm assumes driving on not broken roads, difficult to present to whom came to mind, steering Ferrari to park on a kerbs. In front of Ferrari it is put in tires: 235/35 R20, behind Italian of super penalties is put in wider tire covers by dimension: 295/35 R20. Except a coupe, there is a version with open top – Spider, last has on 50 kg the big equipped weight. 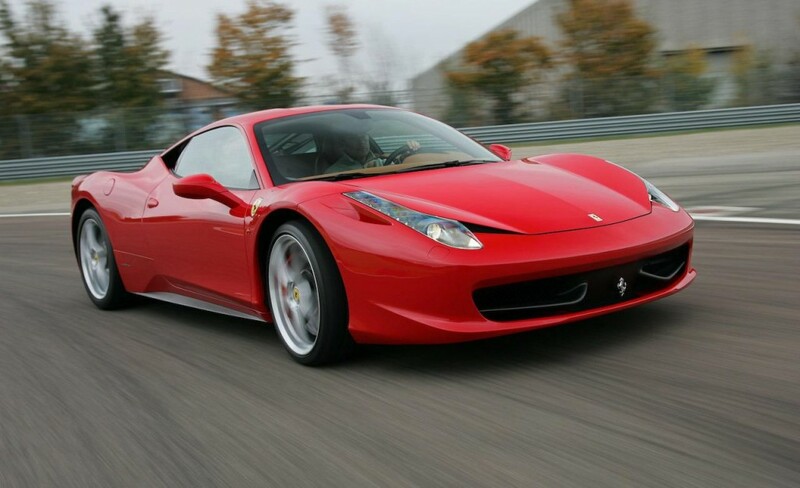 To estimate appearance of a coupe and a roadster you can on a photo of Ferrari 458 Italia. The interior of 458th Ferrari became much better, than interior previous F430. The Front panel almost is completely fitted by a skin, and on a wheel – on the right side you can notice a red lever named Italians Manettino. Clicking this switch it is possible to change options of the engine, transmission, brakes and a suspender. Base equipment of Ferrari includes tow zone climatic control installation. The interior double, but behind backs of seats is provided a compartment in capacity in 140л which can be used for various luggage. Besides things can be put and in a luggage compartment, which capacity makes 230л – very much not badly for the car of such class. Heart of this Ferrari is atmospheric V8 volume of 4 499 cubic centimeters. 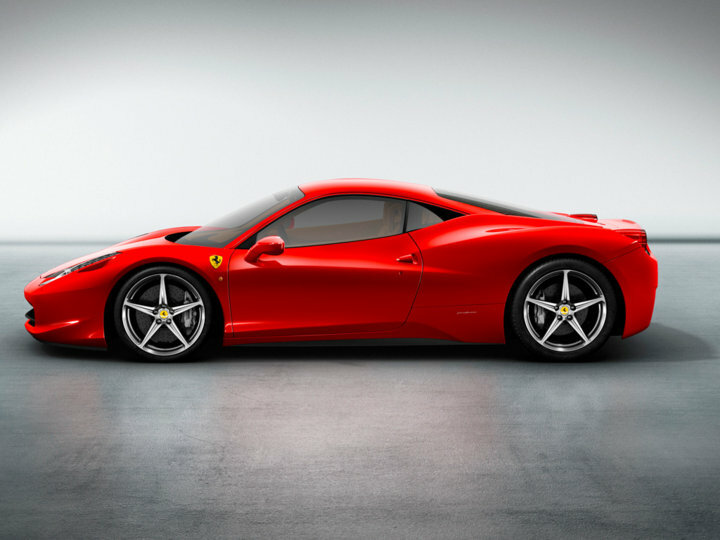 At capacity in 570 HP, and the maximum twisting moment equal 540 Н.М, Ferrari 458 gets to 100 km/h just in 3.4 seconds. The superiority of capacity over a twisting moment speaks about high torque of the engine. A compression ratio of the engine of Ferrari – 12.5:1. Weight of the engine – 274 kg. The Power-plant of the Italian car is unusual also very big corner of a camber of blocks which makes 90 degrees. On a set 200км Ferrari is required to it of all 9.4 s, and speed in 300 km at the wheel 458th model can be reached already through 32.4 s after start. The mile quarter passes the Italian super coupe for 10.88 seconds and gets to the 214 km/h. Despite tremendous capacity, Italian of super penalties corresponds to ecological norms of Euro 5. The engine of the Italian coupe is equipped by system of a dry crankcase which functions by means of five oil pumps. The engine with a dry crankcase is simply necessary for such fast cars, after all at so sharp dispersals and braking, and also at sharp evolutions, oil in a crankcase of the usual engine can “worry” and not goes through the pump that leads to oil starvation of the engine. Seven-high-speed automatic gearbox Getrag spends for switching no more 0.4 seconds, the same check point is established on Mercedes SLS AMG. Diameter of front brake plates – 398 mm, rear – 360 mm. If you want to buy Ferrari 458, it is possible for $400 000.